Ulysses Grant was the 18th President of the United States who served in office from March 4, 1869 to March 4, 1877. What was the life of Ulysses Grant like? The short biography of President Ulysses Grant covers important information and facts about his early life, his family, career and the famous events and achievements of his political life. Our short biography of Ulysses Grant provides an interesting and easy way to learn about the life of the President. The following important facts provide a fast overview of important facts about President Ulysses Grant. Facts and Info: Ulysses S. Grant was the 18th president of America and the great military hero of the American Civil war (1861-1865). He led the North to victory over the Confederate South during the Civil but his presidency was marred by various scandals. For additional info refer to 20 Facts about Ulysses Grant. Facts and Info: He was born on April 27, 1822 in Point Pleasant, Ohio. He was named Hiram Ulysses Grant. Hiram was his grandfather’s name and the name Ulysses was after the hero of Greek mythology. Ulysses S Grant died on July 23, 1885 in Mount McGregor, New York. Facts and Info: The career of Ulysses S Grant included the roles of Soldier, Politician and Statesman. He received his military education at West Point and graduated in 1843. He had a very successful military career and was acclaimed as a great hero of the Civil War. He became the 18th president of America in 1869 and served for 8 years during Reconstruction until 1877. Reconstruction was the system of bringing the Southern states back into the Unites States after the Civil War. Facts and Info: Ulysses S Grant married Julia Dent Grant on August 22, 1848. Grant proposed several times before Julia finally accepted. She was the daughter of a wealthy slaveholding planter and merchant. Ulysses and Julia had 4 children whose names were Frederick Dent, Ulysses Simpson, Ellen Wrenshall and Jesse Root. Facts and Info: Ulysses S. Grant belonged to the Republican Political Party. He was 46 years old when he was inaugurated as the 18th president. Inauguration is a president's swearing-in ceremony. Colfax and Wilson stood as Vice presidents. For additional facts refer to his Presidential Cabinet members. Short Biography of Ulysses Grant: What he was like! Facts and Info: Ulysses S Grant was 5 feet 7 inches in height and was slightly built. He had wavy brown hair, soft clear blue eyes and wore a full, rough reddish beard and moustache. He was a quiet and soft-spoken man and walked with a slouch. After his presidency Grant incurred a debt of $16 million in a disastrous venture on Wall Street. Facts and Info: Ulysses S Grant implemented the Congressional plans to reoccupy the South during the Reconstruction era. The Transcontinental Railroad was completed in 1869 connecting the east and west coasts of the United States with a single rail line. Many people heavily invested in railroad construction but when a important investor went bust this triggered the economic Panic of 1873. In 1876 the defeat of the 7th Cavalry led by Custer against the Sioux and Cheyenne Indians at the Battle of the Little Bighorn shocked the nation. His time in office was marked by numerous scandals and corruption. He was never personally implicated but his reputation suffered. The Black Friday Scandal saw the collapse of the U.S. gold market and a financial panic. The Credit Mobilier construction company, involved in the building of the First Transcontinental Railroad, was implicated in a corruption scandal. Facts and Info: Ulysses S Grant died of cancer of the tongue and tonsils on July 23, 1885 in Mount McGregor, New York. He is buried, with his wife, at Grant’s Tomb in Manhattan. The granite and marble monument is the second largest mausoleum in the Western Hemisphere. 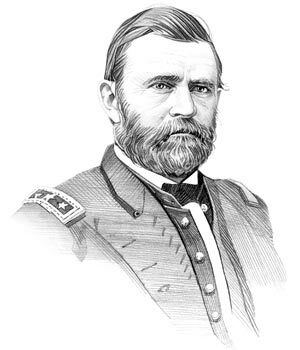 The short biography of Ulysses Grant provides a fast overview of the key facts and events about his life and the accomplishments of his presidential term in office. The following Ulysses Grant video enables you to sit back and listen to the history of his personal and political life - a useful educational resource for kids, children and schools learning about the life of President Ulysses Grant.